This was the first publication of the new blelb Publishing House. We have inaugurated our new blelb Publishing House width a first title. Others will follow which will all deal with sophisticated aspects of visual perception. Our goal is to establish a platform for authors from art and sciences to communicate these visual phenomenon through both pictures and text. For more publications see german page. 68 Pages, 15 x 21 cm Avec traduction française. With English translation. 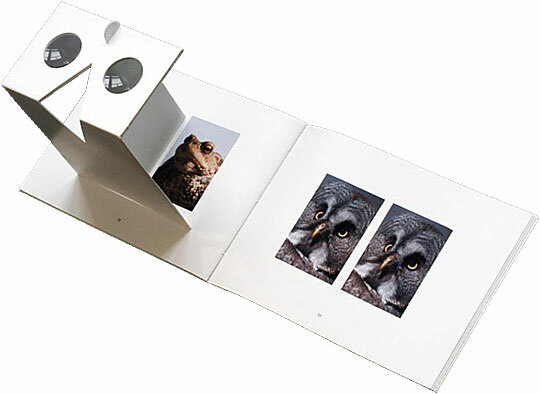 photographed and presented by Hans Knuchel, Zürich. 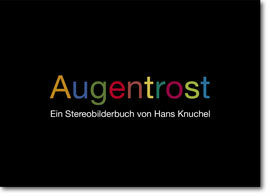 With texts by Urs Stahel, Fotomuseum Winterthur, and Peter Brugger, Neurobiologist, University of Zürich. centre the glasses between the two pictures. Place nose in the triangular opening.